Sonya Larson didn’t set out to write “Gabe Dove,” one of the stories chosen by Meg Wolitzer for inclusion in TheBest American Short Stories 2017, differently than her previous stories. But circumstances forced her hand. “I was in a state of exhaustion. I had no more ideas.” Her job was demanding 10 and 12 hour days, but she had to turn in a story for her graduate program, The MFA Program for Writers at Warren Wilson College. So she wrote on the bus, in waiting rooms, wherever she could. “I was too strained to put on my good writer brain,” she said. Her good writer brain wrote Literature, which she defined as, “beautiful stories with beautiful sentences about life, history and flowers.” But those stories were a slog for her to write, and she knew they weren’t quite what she wanted to produce. Since the writer brain was nowhere to be found, all she was left with was herself: Sonya Larson, an Asian-American woman living in Boston, wanting to find the love of her life and not having a good time of it. This story poured out of her. “The first draft was a mess,” she said. But it was alive. It drew on her humiliating dating experiences, the open racial profiling of dating websites and the conflicted encounters with racism and colorism that she knew many people of color experienced. Thus, “Gabe Dove” was born. 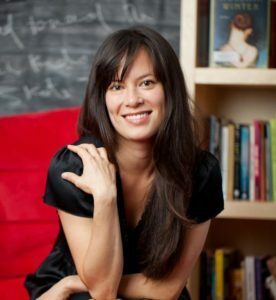 Initially, Larson thought, the protagonist, Chuntao, a Chinese-American woman, would go on a date with a white man and experience a million papercuts of racism. But the two characters had very different power statuses, and white-man-as-villain was both too familiar and not what she wanted to explore. The story lacked tension. Where Gabe Dove is deeply invested in his culture, Chuntao is disinterested. Both of them struggle financially, but Gabe Dove’s situation is intentional: He’s sending money back to his relatives. These differences make space for Chuntao’s internalized racism to come to the fore. What the character would have hidden in the presence of her white ex-boyfriend, she feels free to show to this man she doesn’t completely respect. Key to the effectiveness of this story is Chuntao’s inarticulateness and her guilelessness. Larson intentionally wrote Chuntao this way. “[Chuntao] isn’t interested in intellectualizing her experience.” Larson explained that racism is often discussed in intellectual terms. “But the emotional truth needs getting at.” By having a character who is blunt and shameless, the scenes stay in the physical and emotional world. Chuntao’s personality also disarms with its directness. She may not be likeable, but her struggle and her confusion is as much in the foreground as her internalized white supremacy. After Larson wrote this story, she went on to write, “The Kindest,” which was published in American Short Fiction, and highlighted on Ploughshares’ blog.